August « 2009 « R-V There Yet? We’ve stopped in the Dallas/Fort Worth area for a few days to visit with family and deal with a few doctor appointments. 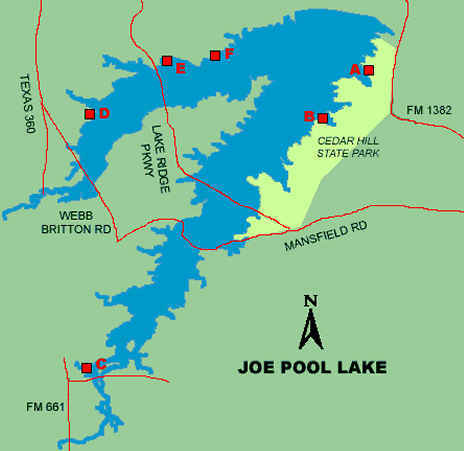 Once again, we have set up camp at the Cedar Hill State Park on Joe Pool Lake. Unlike our last visit, we pretty much have the place to ourselves. 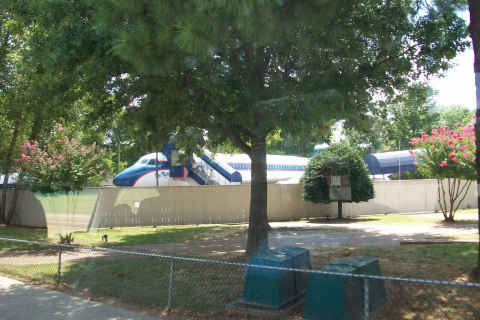 In the loop we’re in we have no neighbors. We had a nice couple of days visiting with children and grandchildren. We want to wish Lance a happy birthday, on this his 35th. We’re off to the Central Texas coast for a couple of days and then down to the Rio Grand Valley, prior to a week at South Padre Island. Diamonds are a girl’s best friend, sometimes. Not necessarily if you have to dig for them. 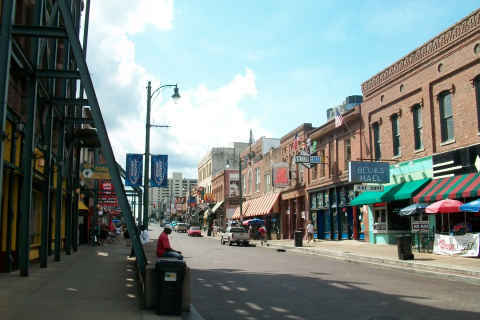 I can’t believe that we hit two towns named Murfreesboro in the same week. One is in Tennessee and the other is here in Arkansas. This one is home to Arkansas’s Crater of Diamonds State Park. 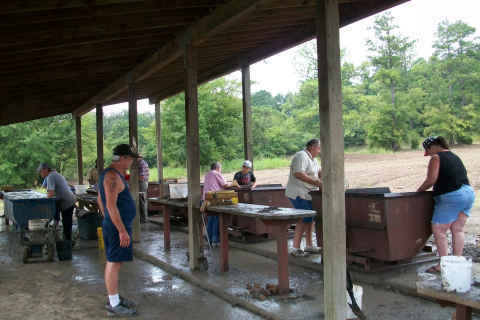 This park is the only diamond mine that the general public can enter and play “finder’s keepers”. 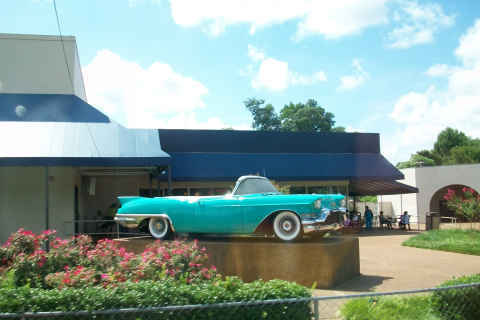 The location is just outside Murfreesboro, Arkansas. 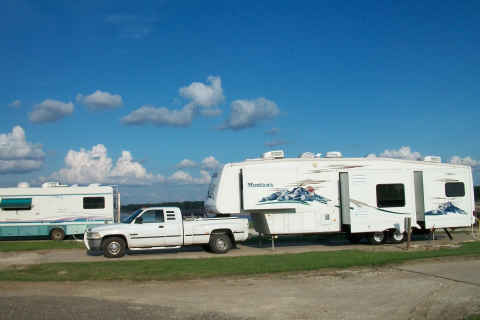 The state park’s RV park was closed for remodeling and promises to be outstanding next spring. But the road there is as narrow, in spots, as driving in Mexico. 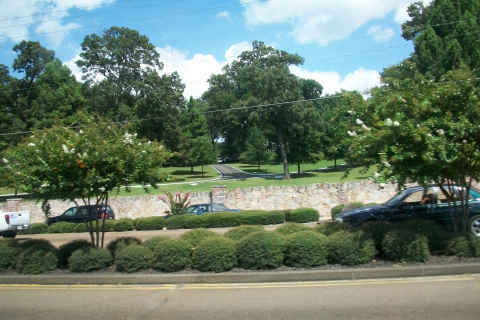 We elected to stay 40 miles away at the Arkadelphia Campground. The folks there are quite nice. Most of their sites are a little narrow. With our four slide-outs, we only had inches on each side. They did have good cable TV, which is a plus, since we couldn’t get satellite reception because of trees. Anyway, we stayed for two nights. Our goal for this stop was a trip to the Crater of Diamonds to make our fortune. It had rained the night before our arrival and for a nominal fee, we set out to attack the muddy diamond field. This place is called a crater because it was created by the Prairie Creek Volcano. After some brief instruction, we rented some tools, which consisted of a shovel, three screens, and a bucket. We marched to the field and started to dig for our fortune. Rick found a spot to dig that looked like all the other places to dig. Thank goodness that it was overcast, the humidity and sunshine would have made it unbearable. After digging, we had to sift the material through the screens and end up with some various aggregate substance, rocks. This sifting process takes place in one of many dumpsters full of muddy water. After sifting, you spread the remainder out on a table and look for gems. Tinka, on left, is using a pocket knife to pick at the rocks. 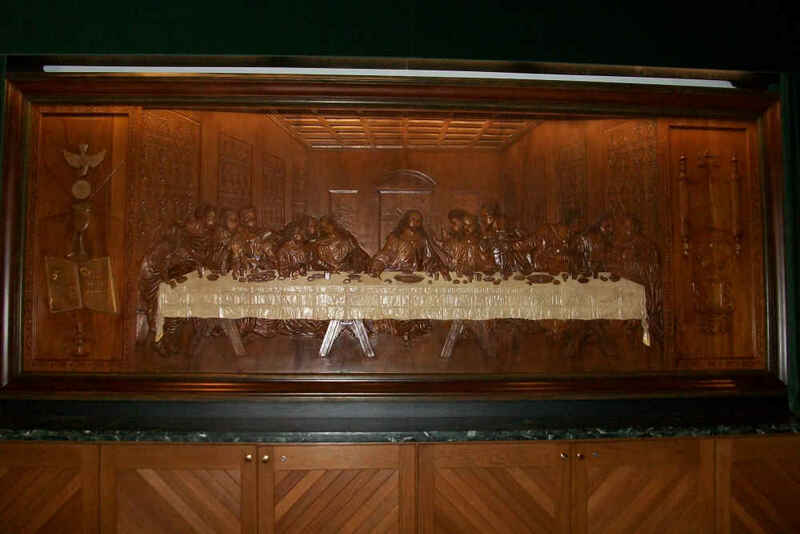 The largest diamond found at this location was over 40 carats in 1924. On average, the park has about 3 diamonds found each day. Our count, ZERO. If we lived in the area, we would certainly try it again, but perhaps after one of the periodic plowings. The last time it was plowed was in mid June. 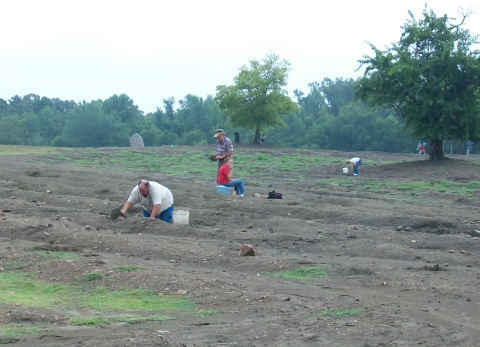 Our joint consensus is that panning for gold provides better odds at finding something. We had a ball on our gold trip in California a couple of years ago. View our report on finding gold. 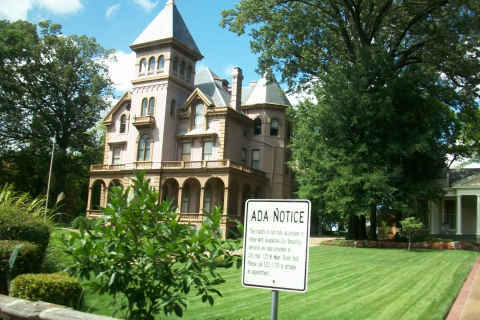 One thing we did find was the quaint town of Delight, Arkansas. 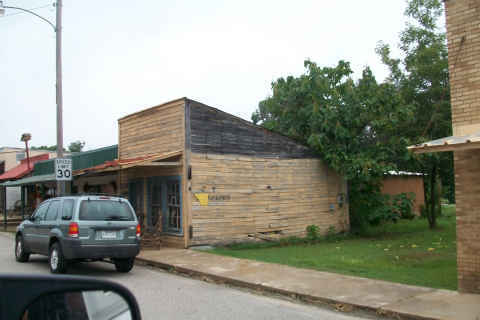 They may, perhaps, have some of the oldest Main Street buildings still in use. We called it a day at about 2:00 PM and just as we returned to the park office, down came torrents of rain followed by blazing sunshine. Once again timing is everything. 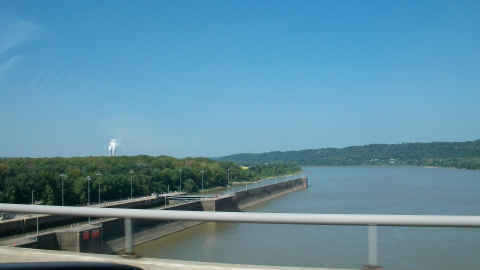 We headed across the Ohio River into Kentucky on our way to Tennessee. As with many places, they use a dam as a bridge. 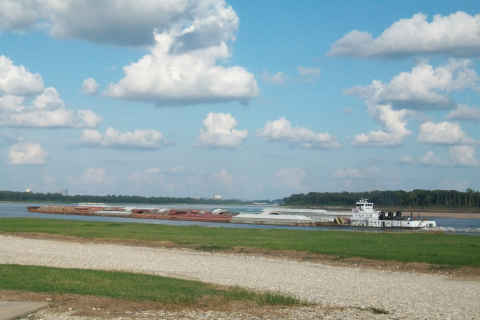 Of course, on large rivers, with a dam comes the locks to assist the large amount of barge traffic. We’ve finally made it back into the land of southern accents and restaurants with salsa. It is amazing that there are any trees left in the southern states. 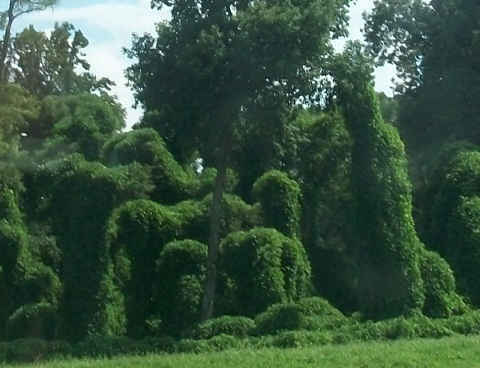 The kudzu vines seem to be taking over. 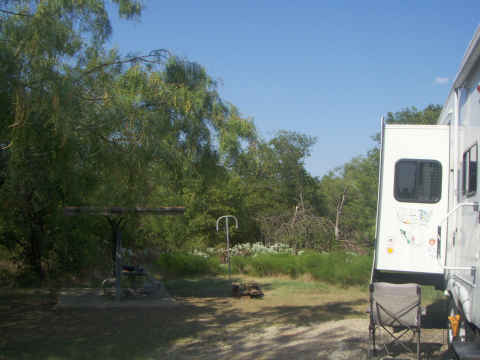 We spent a nice relaxing weekend with friends, Mike and Patti, who spend winters at the same Rio Grande Valley RV resort that we do. 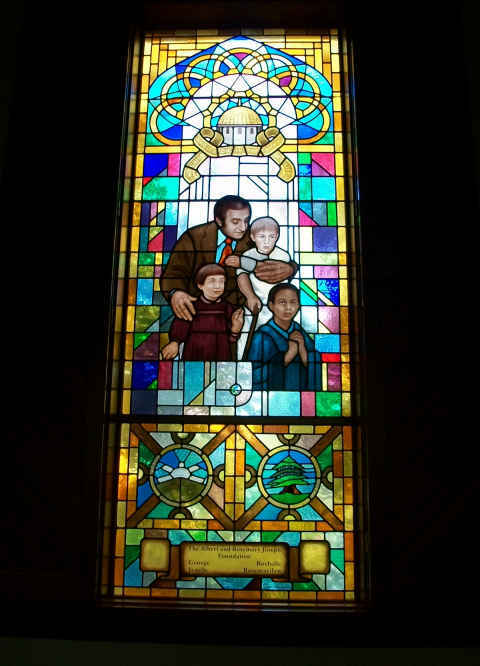 They live in eastern Tennessee and were nice enough to meet us in the Murfreesboro area (near Nashville). We interrupted our relaxation to get off a few games of pêtanque and shuffle board. It was good to see Mike and Patti. We’ll see them when they get back to the Valley in January. We moved along into Ohio for our next night’s stay. In West Salem, OH we stayed at the Town and Country Campgrounds. We were only staying one night, and it was raining lightly as we arrived, so we didn’t do much in the way of exploration. They have several pull through sites, but, we opted for a back-in that was certain to allow us access for our TV satellite dome. 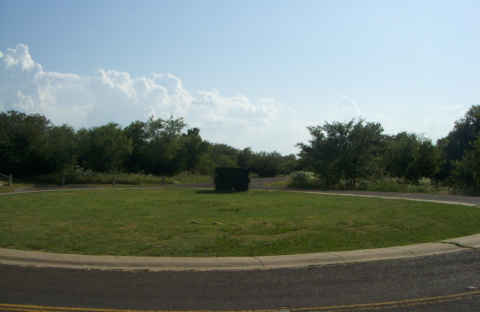 This is a very large park and has all of the amenities including a small fishing lake. 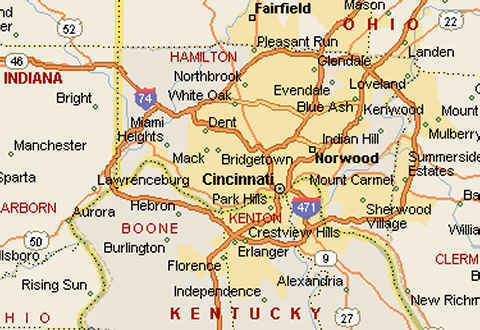 Our next stop was the Cincinnati area. 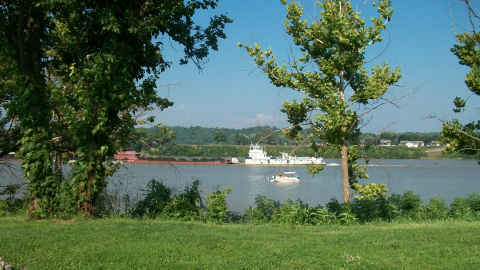 Cincinnati is located on the Ohio River at a point where Ohio, Indiana, and Kentucky meet. We drove through Cincinnati and crossed the Ohio River to the Indiana side. We had decided on an RV site at Rising Sun, IN that was called “Little Farm on the River” It turns out that we made the right decision. 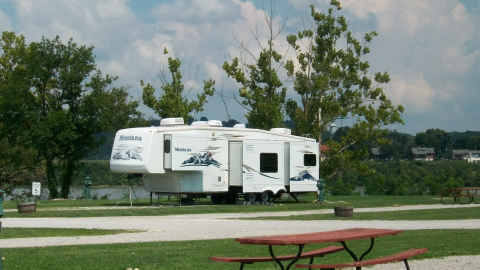 This facility may be one of the best run and maintained RV parks that we have had the pleasure to visit. 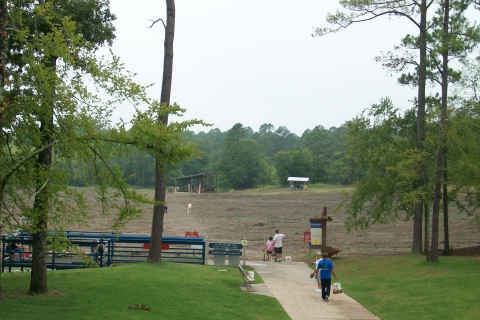 The park is in two sections, near the road, they have a section for RV’s, the swimming pool, general store, club house, etc. 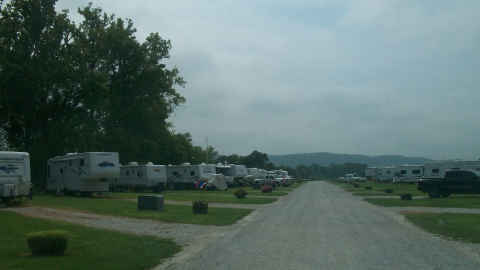 At the bottom of the hill, alongside the river were two rows of very spacious RV sites. Ours was right on the river, near the laundry/bath house and a small pavilion with free Wi-Fi and a wonderful view of the river. 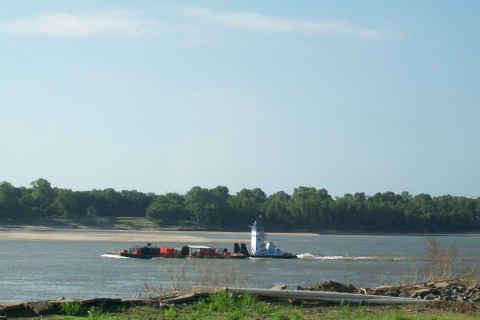 The barges heaping with coal and other commodities moved up the river propelled by the largest tug boats we’ve ever seen. 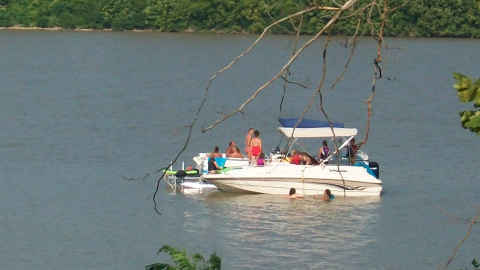 Many boaters enjoyed the river. These two boats formed their own little island. Apparently, several people stay by the season or the month. There weren’t that many people around, but several rigs awaited. 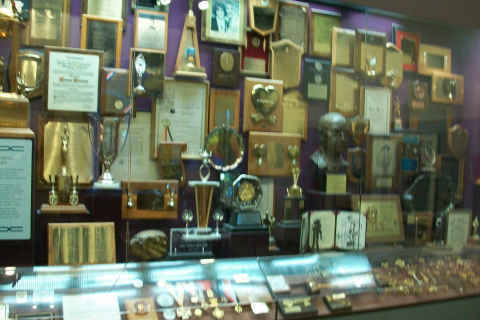 This shot is of about half of the lower section. 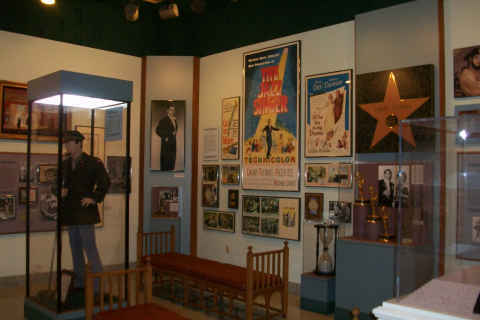 The other end of this section was mostly empty when we arrived, but filled as the weekend approached. 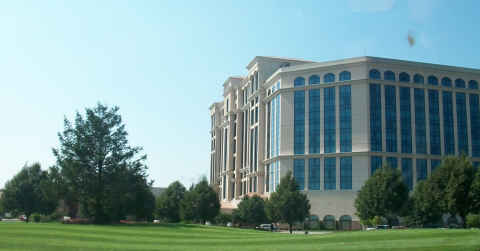 We extended our stay here for about 4 days to allow Rick to visit the Chiropractor over several days. Between doctor visits and the ritual to read the FAQ about those procedures, we occupied ourselves by visiting the many casinos in the area. 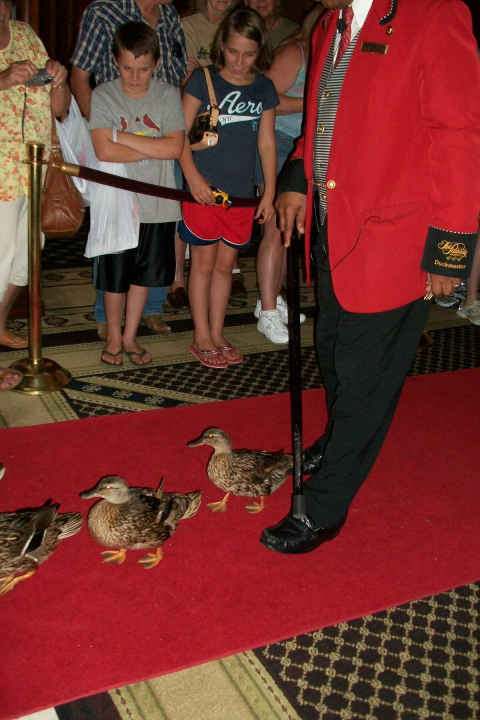 Our diets were put under stress with at least 4 visits to the casino buffets. 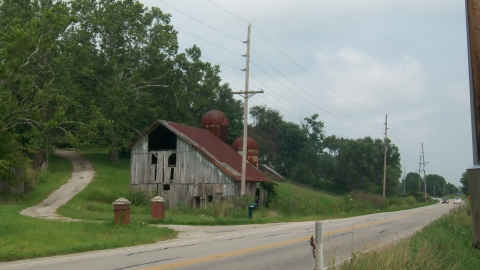 The area was scattered with old buildings and barns. This one caught our fancy. 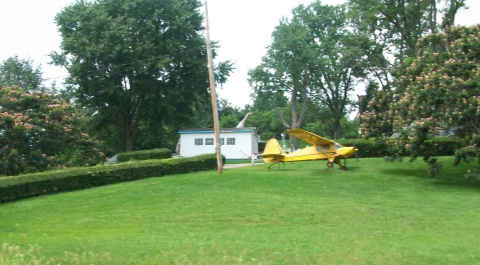 If you think that yards decorated with pink flamingos might be a little tacky, how about a Cessna. We certainly enjoyed our stay in the “Tri-State” area and, if Texas hadn’t been calling, we might have liked to stay even longer. You are currently browsing the R-V There Yet? blog archives for August, 2009.